Bagel Бејгл bakery is a social enterprise founded by NGO Atina whose profit is used for financing human trafficking victim support programs. It was open in 2014, both a bakery and a place where the users of NGO Atina programs acquire knowledge and skills tha help them land a job. So far 30 participants in Atina program have taken cooking training here. Many great things happen in one place – it offers a wide range of qualitz products that are made from local groceries, aditive free; women and neighbourhood solidarity is encouraged, as well as entrepreneurship, and thereby it contributes to decreasing poverty– especially among threatened social groups. After only 3 years Bagel Бејгл manged to become a profitable business that grows and develops its products and services. In particular, catering service is developing, and used by numerous well-known companies, banks, organizations and institutions, and their support is the key to success and further development of social enterprise. Therefore, next time you look for a place for breakfast, snack, or need catering for your personal or work event, reach out to lovely ladies in Bagel Бејглand become a part of this very important story. Bagel is a bread product originating in Jewish communities of Poland, that was continued to be made even after they immigrated to the US where it became famous and popular. In some parts of the USA and Great Britain nowadays bagel is a signature food, just like “burek” in our country. In Bagel Бејгл bakery delicious sandwiches are made, and the process of making this pastry is very specific. It is made from high-protein flour and is shaped by hand in a special way, so that proteins develop within the dough itself. The dough is left sit and grow from 12-18 hours at 4C temperature. It is bolied first, then baked, which adds to bagel’s specific and unique taste. 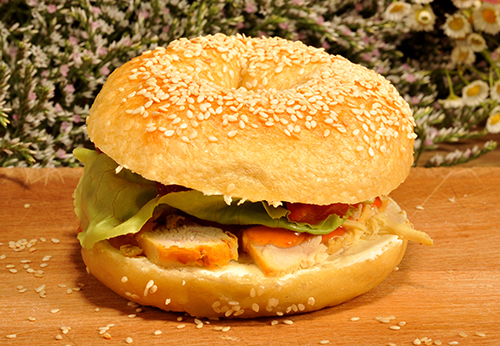 Bagel is made of selected type of home-made flour, and, other sides are chosen from fresh and quality ingredients. NGO Atina is the Association of Citizens for Combating Human Trafficking and all Forms of Gender-Based Violence.